Sea Gulls – Chesapeake Chapter U.S.L.H.S. Sea gulls, lighthouses and the beach go together, unless you live in Hawaii since it does not have seagulls because of the ocean currents. 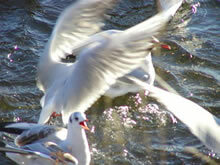 Sea gulls are adapted to most climates and therefore the food supplies of many lands. They are capable of surviving in the summer heat or the Arctic cold, to cross oceans, and to associate with man when it is to their advantage. The most sea gull species inhabit the ocean shores or along the shores of lakes and large rivers. They live where land and water meet. 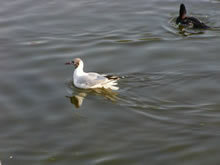 Sea gulls possess the unique ability of being able to drink either fresh or salt water. Sea gulls are equipped with a pair of glands above the eyes that handle the problem of excreting the salt. This allows them to find food in two environments. Sea gulls do cause problems for man. In 2003 Tokyo’s Haneda airport shut down a runway three times in one day as seagulls flocked to it, grounding or delaying scores of domestic flights. Sea gulls also boldly beg for scraps and can disrupt your day at the beach. For the lighthouses, sea gulls pose many problems. First, in areas where seabirds migrate huge flocks have been known to fly into tower and break the lantern room windows. Many lighthouses have installed bird spikes on the top of the cupola to discourage birds from perching and fouling the ventilation opening to the lantern. Still others have installed “mini” electric fences around perching areas to discourage the birds from landing without harming them. Sea gulls are just one of the ‘Seabirds’. Other birds considered to be seabirds include terns, albatrosses, petrels, shearwaters, cormorants, gannets and boobies.